Has anyone installed a CD player on a GL1500? Why when a digital player is much smaller, probably cheaper, holds way more and doesn't care if it gets shaken a bit. 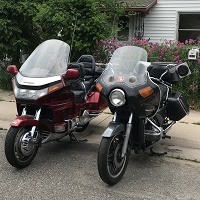 PO installed an Alpine 6 CD changer in the right saddlebag on mine, plays MP3 discs too. Plays thru the FM via direct-connect Modulator, which also has selectable AUX input. Modulator stuffed under the left pocket and the little 1" x 4" x 1/2" head-end control unit mounted on the shelter are all part of the Alpine system, interconnected by 8 pin mini-DIN cables. CD Skipping is not an issue, it must have good "read-ahead". Sound quality excellent! But I find if not playing the radio, more often than not I'm playing my Sandisk MP3 player connected thru the AUX, but I do keep a selection of CD's that aren't loaded to the MP3 player. With that in mind, if I were installing equipment I would have probably just installed the i-Simple direct connect FM modulator and just used the Sandisk player. If I want different music it is very easy to swap Micro-SD chips (slot on the side of the player) and it can read up to 32GB chips. And anymore the chips are ridiculously cheap. So you can pack an awful lot of music without it taking up any space at all.